The Title "Babur-Nama (Memoirs of Babur) Translated from the Original Turki Text of Zahiru'd-din Muhammad Babur Padshah Ghazi 2 Vols. in 1" is written by Annette Susannah Beveridge. This book was published in the year 2010. The ISBN number 8175364254|9788175364257 is assigned to the Hardback version of this title. This book also comes in Paperback . This book has total of pp. lxi + 716 + lxxxii + 717-880 (Pages). The publisher of this title is Low Price Publications. We have about 1140 other great books from this publisher. 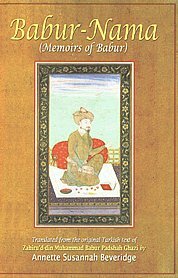 Babur-Nama (Memoirs of Babur) Translated from the Original Turki Text of Zahiru'd-din Muhammad Babur Padshah Ghazi 2 Vols. in 1 is currently Not Available with us.You can enquire about this book and we will let you know the availability.